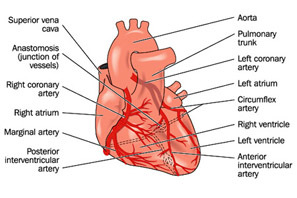 The heart is a muscular pump that provides the force necessary to circulate the blood to all the tissues in the body. Normal adult heart pumps about 5 liters of blood every minute throughout life. Its function is essential as tissues need a continuous supply of oxygen and nutrients and metabolic waste products have to be removed. Blood is the transport medium and heart is the organ that keeps the blood moving through the vessels. Two major coronary arteries branch off from the aorta: Right coronary artery (RCA) – Which supplies 20 – 30% of the heart’s blood. Left main coronary artery, which again branches into: The circumflex artery, which supplies 20 – 30% of the heart’s blood. The left anterior descending artery (LAD), which supplies 50% of the heart’s blood. Right coronary artery (RCA) – Which supplies 20 – 30% of the heart’s blood. The circumflex artery, which supplies 20 – 30% of the heart’s blood. The left anterior descending artery (LAD), which supplies 50% of the heart’s blood. 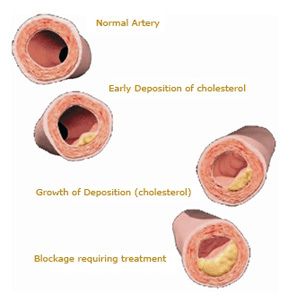 Atherosclerosis (sometimes called “hardening” or “clogging” of the arteries) is the buildup of cholesterol, and fatty deposits (called plaque) on the inner walls of the arteries that restrict blood flow to the heart. The most common symptom of coronary artery disease is angina (also called angina pectoris). Angina is often referred to as chest pain. It is also described as chest discomfort, heaviness, tightness, pressure, aching, burning, numbness, fullness, or squeezing. It can be mistaken for indigestion or heartburn. Angina is usually felt in the chest, but may also be felt in the left shoulder, arms, neck, back or jaw. WATCH OUT FOR THESE SIGNS!! Learn to identify your symptoms and the situations that cause them. If your chest pain (angina) lasts for more than 5 minutes and if you don’t have prescription for nitroglycerin – call for emergency help. If you have been prescribed nitroglycerin and you experience angina, stop what you are doing and rest. Take one nitroglycerin tablet and let it dissolve under your tongue, or if used in the spray form, spray it under your tongue. Wait for 5 minutes. If you still have angina after 5 minutes, call your doctor. Call your doctor if you begin to have new symptoms or if they become more frequent or severe. Risk factors are traits and lifestyle habits that increase your chance of disease. The more risk factors you have, the higher your chances of having a heart attack or stroke. Increasing age: The older you get the more likely you are to develop heart disease or have a heart attack or stroke. Gender: Males have a greater risk of heart attacks and have heart attacks earlier than women do. Previous heart attack or stroke: If you’ve had a heart attack or stroke you’re at a higher risk of having a second heart attack or stroke. Family history of heart attack or stroke: The chance of a stroke is greater in people who have a family history of stroke. Cholesterol is a soft, fat like substance found in the blood and in all the body’s cells. Some cholesterol is needed for the body to function normally. Having a healthy cholesterol level is important for everyone. The best way to understand your cholesterol is with a “lipoprotein profile”. This is a blood test that reveals total cholesterol, LDL (BAD) cholesterol and HDL (good) cholesterol. It also measures triglycerides (blood fats). Certain fats you eat can help lower your cholesterol. Polyunstaurated and monosaturated fats help lower blood cholesterol when eaten in place of saturated fats. Plant oils are often high in these. Instead of butter try to use vegetable oils in the foods you cook and eat. Make time in your life for daily physical activity. It helps control blood cholesterol, diabetes and obesity. It also helps lower blood pressure and reduces your stroke risk. People who have excess body fat are at a higher risk for health problems, especially if a lot of fat is in the waist area. People with excess body fat are at a higher risk of stroke. Everyone feels stress but people react differently. Over time, unhealthy responses to stress may create health Problems. Find ways to address the cause of your stress and be sure to make time for things you enjoy. Drinking too much alcohol raises blood pressure and can cause heart failure or stroke. If you drink alcohol do so in moderation. If you don’t drink, don’t start. Alcohol is high in calories and low in nutrients. Moreover it can be addictive. Intravenous drug use carries a high risk of infections of the heart (endocarditis) and stroke. These events can be fatal and affect even first time users. Doctor may use various methods to diagnose CAD 1. Electrocardiograph tests, such as an electrocardiogram (ECG or EKG) or exercise stress tests, to evaluate the electrical activity generated by the heart at rest and with activity. Echocardiogram involves a use of transducer which works on a sound wave to detect the problem with your heart; sound waves produced by the transducer are reflected back from the chest surface which are received again and sent to a computer to generate report. 2. Laboratory Tests: These include a number of blood tests used to diagnose and monitor treatment for heart disease. 3. Coronary angiography performed by a cardiologist in a cardiac catheterization lab; involves inserting catheters into the blood vessels of the heart in order to get a closer look at the coronary arteries. (most confirmatory test among all) These tests help your doctor decide how to treat you. Treatment of coronary artery disease is aimed at controlling symptoms and slowing or stopping the progression of disease. The method of treatment is based on many factors determined by your symptoms, a physical exam, and diagnostic testing. You may be asked to change the life style, physical activity and diet control. If the blockage is less than 70 percent, medications may be the first line of treatment and if greater than that you might be asked for angioplasty with or without stent or coronary artery bypass surgery (CABG). To prevent damage to your heart muscle, do not delay seeking medical treatment. Procedure in which a thin tube known as guiding catheter is inserted through groin or wrist and is then moved towards the site of blockage. A small balloon at the tip of the balloon catheter is inserted through the guiding catheter near the blocked or narrowed area of the coronary artery. (See figure below) When the balloon is inflated, the fatty plaque or blockage is compressed against the artery walls and the diameter of the blood vessel is widened (dilated) to increase blood flow to the heart. Once the plaque is compressed and the artery if opened sufficiently, the balloon catheter is deflated and removed. Coronary stents are placed during a percutaneous coronary intervention procedure, also known as an angioplasty. Angioplasty is a non-surgical procedure that can be used to open blocked heart arteries. Stent Angioplasty restores blood flow through narrow or blocked arteries. A stent helps support the inner wall of the artery in the months or years after angioplasty. There are two types of stent available in market. One is a bare-metal stent & second is a drug-eluting stent. The first stents licensed for use in cardiac arteries were bare metal stent (BMS)- often 316L stainless steel. More recent (‘2nd generation’) stents use cobalt chromium alloy. Some stents are coated with medicine that is slowly and continuously released into the artery. These stents are called drug-eluting stents (DES). The medicine helps prevent the artery from becoming blocked again. A stent is a small, metal mesh tube that acts as a scaffolding to provide support inside the coronary artery. The shape and material of the stent results in a flexibility which can be expanded by a balloon to adapt to the shape and curves of the artery. Stent is introduced into the blood vessel through the femoral or radial artery on a balloon catheter and advanced to the blocked area of the artery. The balloon is then inflated; which causes the stent to expand until it fits the inner wall of the artery. The balloon is deflated and withdrawn. Stent stays in place permanently, holding the vessel open and improving the flow of blood. Re-narrowing of coronary artery after it has been treated with either balloon or with the stent. The re-narrowing can be caused by vessel recoil and formation of tissue growth in the treated area. The rate of restenosis in the patient treated with balloon is upto 30 to 50 % and with the stent (without drug) is upto 10 to 30%. After the Angioplasty Procedure, patients are taken to an intensive care unit with special monitoring equipment. Blood pressure, pulse monitoring and ECGs are performed routinely after Angioplasty procedures and do not signify any special problems. You may be asked to stay in hospital for 3 to 5 days depending upon the speed of your recovery. Angioplasty is not a cure, but a treatment to reduce the effects of Coronary Artery Disease. It is extremely important to follow your medication regimen exactly and control your risk factors. After angioplasty your physician will prescribe you with certain medicines. Its easier to follow a treatment plan when you know its importance to your overall health. What symptoms will it help? What tests if any may be needed? What are the risks if any? How much medicine and what time of the day should I take? Should I avoid any foods supplements or Over-the-Counter drugs? Should I avoid alcohol, caffeine or other beverages while taking this medicine? If you have had any allergic reactions or side-effects from any medicine. Be sure to mention if you are taking medicines prescribed by a different physician. a. Inform your physician right away if you’ve had any problems with your medicine. b. Don’t stop taking a prescribed medicine just because your symptoms go away. c. Don’t take medicines prescribed for someone else or give your prescription to anyone else. d. Don’t drink alcohol while taking a medicine unless your doctor says its ok.
e. Always store medications under the proper storage conditions. Unless you are told otherwise keep them away from heat, light and moisture. 7. Prevention is Better Than Cure! Your lifestyle, eating habits and environment all influence how well your heart and body works and how you feel. And ONLY YOU ARE IN CHARGE!! Regular moderate-to-vigorous physical activity can help reduce your risk of heart disease. For most healthy people, at least 2½ hours of physical activity per week of moderate intensity is recommended such as brisk walking. If longer breaks are not available you can exercise in 10 minute segments. You can definitely find atleast 30 minutes per day for exercises by tracking and cutting down on your “screen” time (for example, watching TV, surfing the web, playing computer games). Nutrients rich foods have vitamins, minerals, fibre and other nutrients but are lower in calories. For eg., vegetables, fruits, fish, whole grain products (like whole grain breads, cereals, pasta and rice) and fat-free or low fat dairy products. Vegetables and fruits : Eat especially the deeply coloured vegetables and fruits such as spinach, carrots, peaches and berries which are higher in vitamins and minerals than others such as potatoes and corn. Whole grain high-fibre foods : Choose whole wheat, oats or oatmeal, rye, barley and corn. Also try pop-corn, brown rice, wild rice, buckwheat, cracked wheat, millet, quinoa and sorghum. Fish : Eat fish atleast twice a week as it contains healthy omega-3 fatty acids. Grill, bake or poach fish. Limit commercially fried fish and don’t add cream sauces. Limit saturated fat, trans-fat and cholesterol you eat by reading the nutrients list on the product package. Switch over to fat-free, 1% fat and low fat dairy products. Cut back on foods containing partially hydrogenated vegetable oils to reduce trans fat in your diet. Examples are cakes, cookies, crackers, pastries, pies, muffins, donuts and French fries. Cut back on foods like eggs, shellfish, liver and whole milk which are high in dietary cholesterol. Reduce intake of beverages and foods with added sugars. Choose and prepare foods with little or no salt as this lowers your risk of high blood pressure. To keep portion smaller split the meal with your dinning partner or take half home when eating alone. Ask for sauces and dressings on the side to control fats, sodium and calories you eat. Order grilled, baked, steamed or porched foods instead of fried, sautéed, smothered or au gratin. Try ordering two or three appetizers instead of a full meal and add a salad or a soup. If you choose a dessert split it with your dinning partners or asks for fresh fruit. If you choose to drink, limit yourself to one drink per day if you are a woman and two drinks per day if you are a man. If you don’t drink don’t start as alcohol is high in calories and low in nutrients and also alcohol can be addictive. Exposure to tobacco smoke increases your risk for heart disease, stroke, cancer and other serious illnesses. If you smoke, keep track of when and why you light up. Be aware of the situations and places that make you crave a cigarette. Try changing what you are doing to avoid those triggers. Find out what distracts you when you want a cigarette. Take a walk or wash your hands – whatever works best to redirect your attention. Keep substitutes around to keep your mouth and hands busy. Try eating carrots, sunflower seeds, apple sections and celery or chewing sugar-free gum. Carry a pencil or paper clip to have in hand.